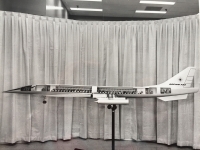 This is a 1960s era proposal super sonic model for a concept put forth by Boeing. The concept never left the drawing boards. 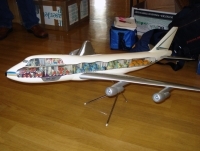 N614BA Model of Boeing's Maritime Surveillance Aircraft (MSA). Includes three additional sensors moulded into the belly, but curiously the ventral fins are omitted on this model. Stand has the same pearlescent paint as the aircraft. This model was for sale at $2000 at the Vancouver show yesterday. What a piece!